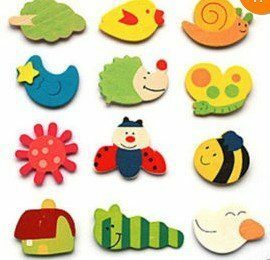 Fun Wooden Animal Magnets Only $1.96 + FREE Shipping! You are here: Home / Great Deals / Amazon Deals / Fun Wooden Animal Magnets Only $1.96 + FREE Shipping! If your kiddos like refrigerator magnets, I have a fabulous deal for you! Get this set of fun Wooden Animal Magnets for just $1.96 + FREE shipping! This is a great way to teach your child different kinds of animals. And, they’re so bright that any child would have fun playing with them on the refrigerator! THese funny cartoon fridge cartoon magnets can decorates your fridge and make your room is full of vital force.